Watch video of Meredith Artley’s keynote speech and discussion from ISOJ 2018. The news cycle and industry have dramatically shifted in the last several years and news organizations should continue to mirror these transitions, according to Meredith Artley, senior vice president and editor-in-chief for CNN Digital Worldwide. 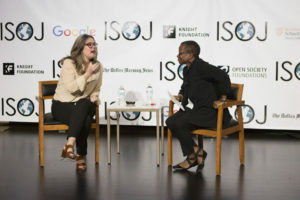 “All things Trump” is among the many forces prompting changes in the industry, Artley said April 13 in her keynote speech for the International Symposium on Online Journalism (ISOJ), which was chaired by Kathleen McElroy, associate director of the Journalism School at the University of Texas at Austin. Coverage of U.S. President Donald Trump prompts news organizations to build off each other’s work, which in turn creates somewhat of a “sisterhood” in the media, she said. Additionally, transformations in the media industry, including changes to the traditional ad revenue model, means organizations find themselves in the same boat. “We’re banding together in a really interesting way, and I think it’s a really lovely thing,” Artley said. And while there’s been a transition in the way news organizations seem to interact, there’s also been a simultaneous change within news organizations over the past several years, according to Artley. One important shift she noted is the need for all journalists – whether they’re print, radio or broadcast – to be modern journalists who think about different ways a story can be packaged and explained. They also need to think digitally, instead of relegating that task to a special team. In addition to concentrating on the professional growth of journalists, news organizations should also focus on improving their homepages and the products they create. Although there are more available platforms for journalists’ stories than before, this doesn’t mean news organizations should spread themselves thin, attempting to create content for every possible outlet, she said. Social media and other platforms are constantly transforming, she said, so it’s risky to put “all your eggs in one basket.” In the changing digital environment, news organizations should instead prioritize the content they can control, starting with their websites, Artley said. She likened websites to a “beating heart,” saying media should make them the main focus. In addition to the planning behind media organizations’ main websites, the thinking behind the stories also need to be more deliberate, she said. It’s important for journalists to be introspective and to always consider who their reporting serves, she said. This will create meaningful content, which increases the impact of the reporting. “I think the best stories are universal and can be told and shared and understood by whoever’s reading them,” she said.